Saturday, March 16th here in Olds was cold, foggy and snowing. Wind chill -32C. Not wanting to sit at home, we decided to head into the west country to check on the wild horses. First checking on some herds in some of our normal areas, we found the temperature had warmed up but the skies were still cloudy with snow. These herds are still doing quite well. Leaving this area, we decided to move further to the west into some valleys we hadn’t visited for awhile. Here we found sunshine and temperatures around zero degrees and this certainly lifted our spirits. 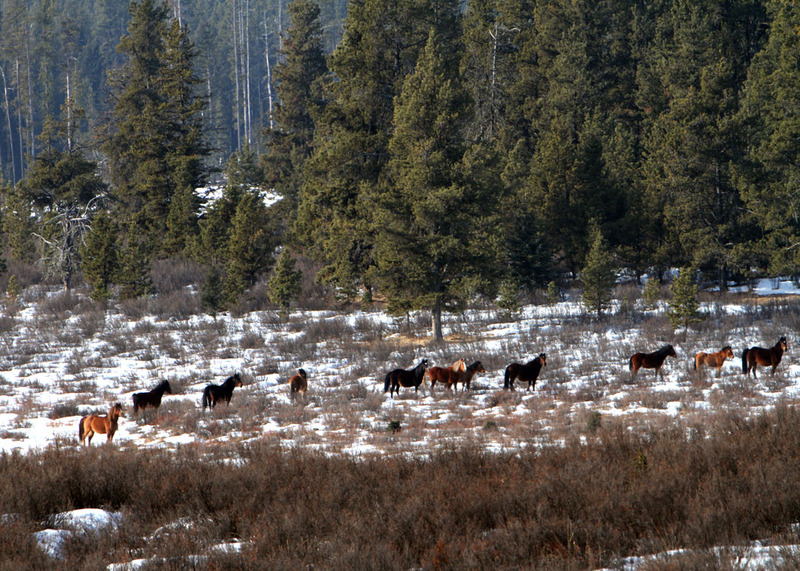 We found this herd with several pregnant mares feeding in this meadow. The snow here was certainly less than that on the areas just to the east. 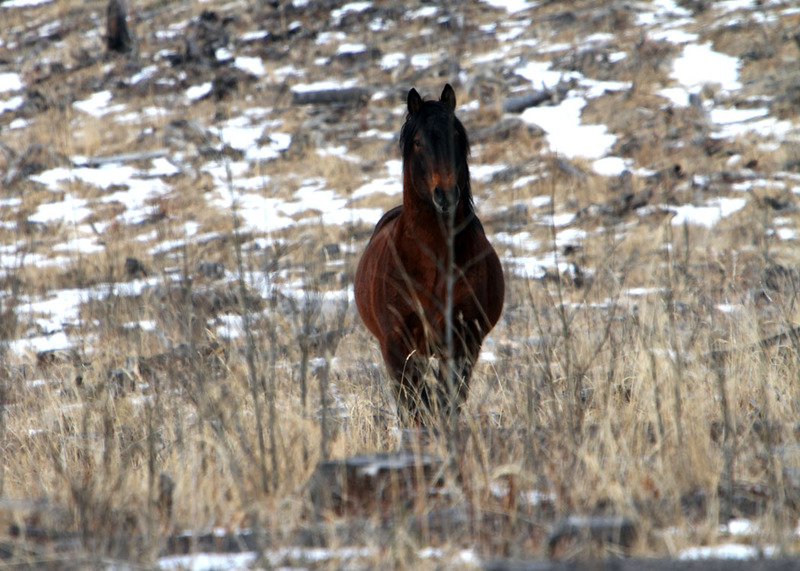 Here you can see that there is little snow cover making it easier to the wild horses to move about and forage for feed. This young stud came flying out of the trees and across the road to join his herd in the meadow below. 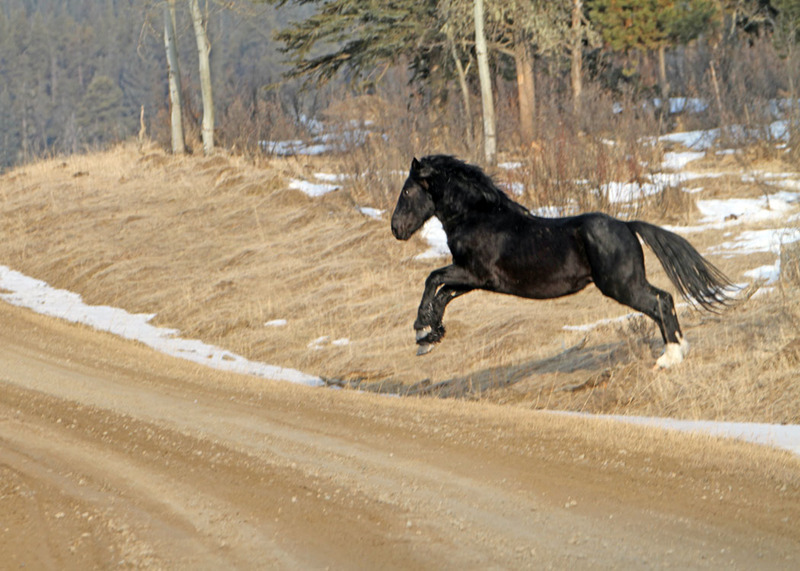 Glossy, shiny and in excellent shape, he exemplifies the beauty that I find in the wild horses. As we continued in our travels checking on the herds, lo and behold high up on a ridge we came across a familiar herd and there standing next to the mare was this beautiful young foal only a few days old. Mom and babe both looked in excellent shape. 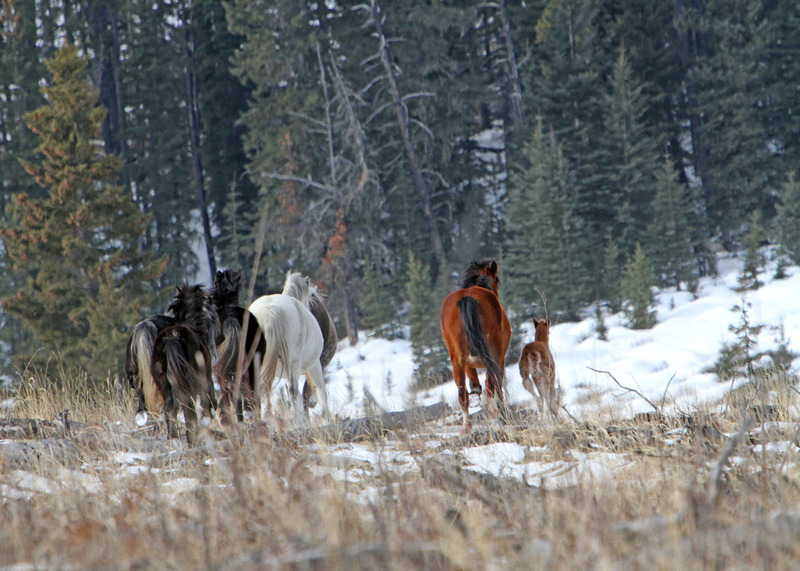 The rest of the herd were helping the mare to protect its young one. Feeding below the mares was the stallion, which is a common trait of wild horse behaviour, but they are always on extreme alert for dangers to their herd. Upon seeing us he just came a-flying to put himself between us and his herd. Nostrils flaring he issued a loud snort to warn us off. 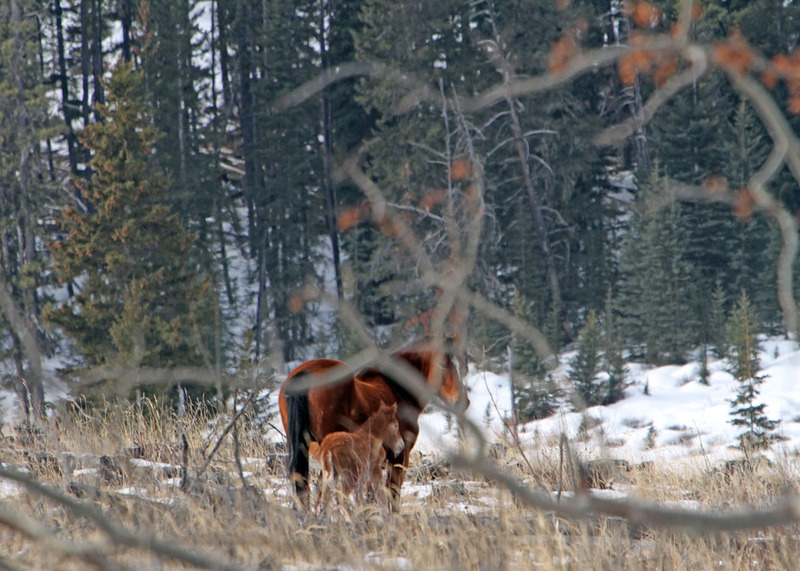 Upon hearing this the lead mare also took this as her signal to vacate and she led the rest of the herd, including the young baby off into the forest. As we continued our journey that day, we found no other mares with foals however we there were several that were extremely close to term. This calls for another trip quite soon again to check on them. We especially want to check on this young foal as waking up Sunday morning, the weather was worse than on Saturday at home. 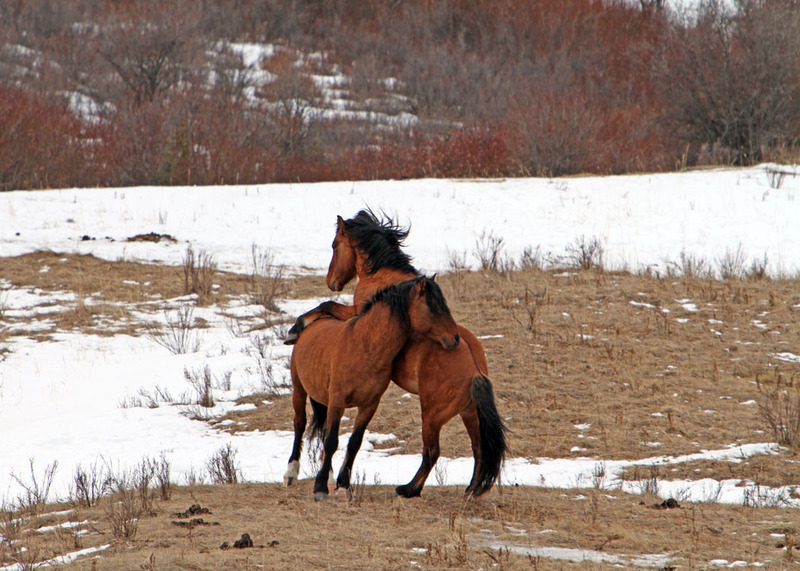 We came across these two young stallions engaged in showing off their fighting skills. In March I’ve found that this is quite common with young bachelor stallions to exercise their future skills needed to gain their own herds. What I found fascinating about these two is that there was a pregnant mare and yearling with them and all appeared to be living harmoniously. After their little skirmish as if showing off for us, they all went back to peacefully grazing together.